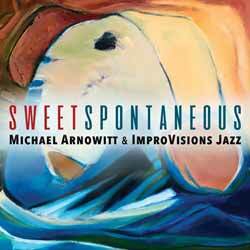 For true connoisseurs of Jazz, Michael Arnowitt's Sweet Spontaneous hits the sweet spot. This 14 track (2 hr, 10 min, 42 sec) opens on the right note with 'Against the Wind', a 9 min, 22 sec that sees Shirley Crabbe's vocals add a rich layer to the recording. 'Bulgarian Hoedown' is a wonderfully intricate piece which, thanks to the beautifully handled opening violin playing of Al Roman, could almost be mistaken for modern classical music. It soon opens out into a rich and deep layered hoedown like you've never heard before. 'Syria-us' is the creative culmination of a deep study Arnowitt made of Syrian literature and music in preparation for benefit concerts he organized in 2016 to support humanitarian aid for Syrian refugees. Arnowitt masterfully takes his inspiration from a wide range world music, giving it his own jazz twist. What's not to like?